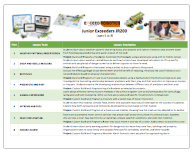 The Junior Exceeders curriculum is designed to introduce robotics to children ages 7 and 8 years old using Lego motors, sensors and bricks, programmed using a user-friendly graphical software installed on IPADs. Each lesson presents simplified concepts in engineering, biology or physics, after which students are guided to build and program a specific robot. The investigation portion of the class teaches the presented concepts through experimentation, using their built and programmed robots. Lesson topics of the first Junior course include speed and time, force and friction, animal metamorphosis, space exploration, etc. In the following course, students are guided to build and program their own custom robots relating to a particular lesson, unleashing their creativity and expanding their knowledge base. The third and following series of courses use a more complex robotics platform (LEGO EV3 Mindstorms) with additional types of sensors and motors. With a more advanced robot and programming software, more advanced projects are assigned throughout courses JR400-JR600. Prerequisites: 7 year olds start here, no experience required! This first junior robotics course introduces the concept of building robots, using motors and sensors and learning programming logic. Each class begins with the introduction of a particular concept followed by the students creating, programming and conducting investigations. Concepts are learned effectively through experimentation. 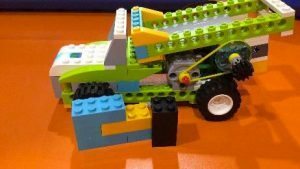 As an example, to teach the concept of speed and time, students build and program a race car to count the number of seconds the car takes to finish the race when small versus large tires are installed. This experiment teaches students that larger tires could be used to increase speed and complete the race faster. Building on the previous course, JR200 expands student knowledge in archaeology, engineering, meteorology and environmental studies. 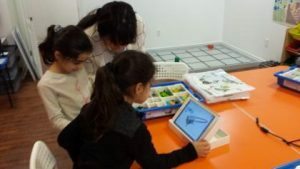 Students are challenged to build and program their choice of custom robots relating to a specific lesson, unleashing their creativity, increasing their confidence and expanding their knowledge base. Students are introduced to a more advanced robot platform and programming software (Lego EV3 Mindstorms) which will allow for more advanced projects. The basics of motor control and programming loops and statements are introduced to perform class challenges relating to space exploration. Students expand their knowledge in programming and robotics by learning to program a puppy’s motors and graphics screen to display various reactions for different scenarios. Sensors are used to detect different conditions that will generate different reactions by the puppy robot.